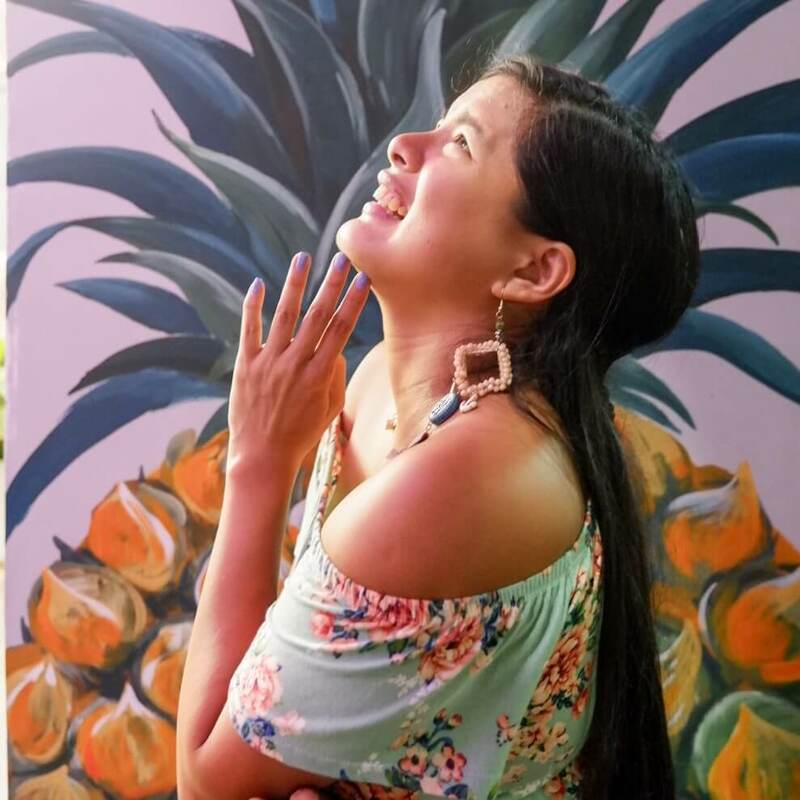 In my previous article, I took you through the top amazing places and things to do in Cairns. I mentioned that Cairns is one of the country’s top holiday hotspots, home to abundant adventures on both land and sea. As a gateway for people wanting to visit the stunning and expansive Great Barrier Reef, the lush Daintree Rainforest, and the rest of Tropical North Queensland. Cairns is their outstanding get-away destination for all the unforgettable nature-oriented experiences. Towards the end, I highlighted my intention of giving you a complete, well-detailed guide on how to explore the Cairns Great Barrier Reef. Well, here I am to fulfil my promise. One of Australia’s most incredible natural gifts, the Cairns Great Barrier Reef is blessed with the breathtaking beauty of the world’s largest coral reef. The reef contains an abundance of marine life and comprises of over 3000 individual reefs, tropical islands with some of the world’s most beautiful sun-soaked, golden Cairns beaches. Because of its natural beauty, the Great Barrier Reef has become one of the world’s most sought-after tourist destinations. The Great Barrier Reef is one of the astonishing wonders of the natural world, and It is apparently the only living thing on earth that is visible from space. There are a diverse range of tourism operations in the Cairns Great Barrier Reef including day tours, overnight and extended tours, snorkelling, scuba diving and fishing charters, long-range roving tours, aircraft or helicopter tours, glass-bottomed boat viewing, cruise ships, water sports, passenger ferries, whale watching, swimming with dolphins and Sharks etc. Snorkel and Diving: Snorkelling and diving are the easiest, cheapest and most accessible way to have a close-up contact or view with the creatures like sea turtles, sharks and humid fish of different sizes and colors that make the Great Barrier Reef famous. Scenic Flights: If you don’t mind viewing the Reef from sea eagle’s view, then take seaplane or helicopter tour. Live-Aboard: If you’re excited to do as much diving as possible, a live-aboard boat is the best option. Glass-Bottom Boat: If you don’t like getting wet but still want to understand what all the fuss is about the Reef? Then go for the glass-bottom boat tours. The marine experts who drive them will whisk you over shallow reefs, point out the different corals, look for turtles, giant clams and anything else they can find. Reef Walking: Many reefs in the southern part of the Great Barrier Reef are exposed at low tide, allowing visitors to walk on the reef top, on sandy tracks between living coral. Get Sunscreen protection: If you are in for the greatest fun, having a sunglass sun protection cream and hat at Cairns’ Great Barrier Reef is paramount. This is because Cairns is a tropical city and the sun is both hot and damaging to unprotected skin. Look for sunscreens that are waterproof and make sure you apply before you start to burn: Don’t wait until you are RED. Sunglasses and hats are extremely recommended for any trip to the Cairns Great Barrier Reef. Avoid Motion Sickness: To avoid motion sickness, it is advisable to take some preventative medication, at least, 30-minutes before to boarding your boat. It is better to prevent any chance of motion sickness, which might spoil the FUN. There is nothing worse than being sick at sea during your Great Barrier Reef visit. You don’t want to miss all the Excitements. Keep Your Distance from Sharks: It is important for you to know that Sharks do habitat on the Cairns Great Barrier Reef: if you encounter a reef shark, just watch from a distance, do not move too close for comfort. Take Along Wetsuits/stinger suits: These are available on most Cairns Great Barrier Reef tour and liveaboard boats. For your well-being and protection, it is vital that you wear these suits when in the water, it is better to be safe than be sober or sorry. Stinger suits are also highly recommended when swimming in the waters, especially in summer (December to March). Avoid Alcohol: You will not be allowed to scuba dive if you have consumed alcohol and it is advised not to snorkel or swim if you have been drinking. 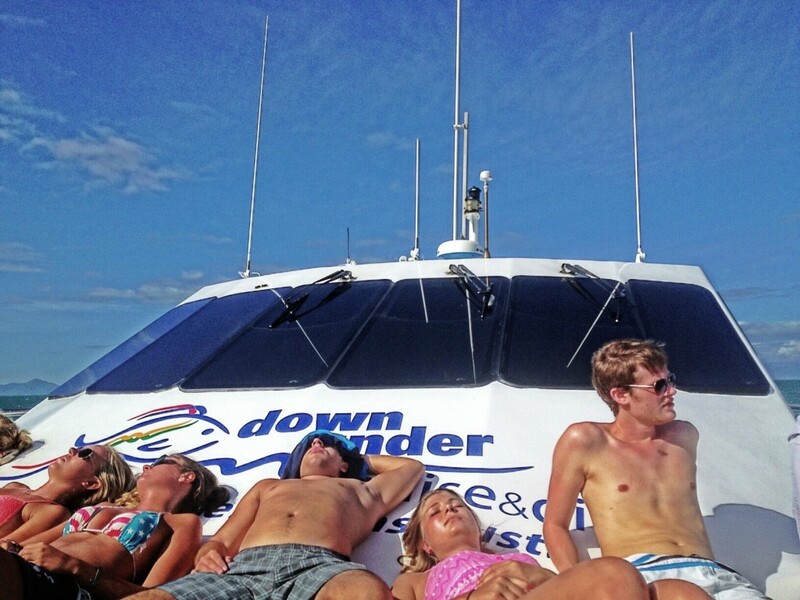 Cairns Reef Tour operators: All Reef operators on Cairns Reef have licensed and well trained. Cairns is the perfect destination from which to explore the many wonders of the Great Barrier Reef. The unspoiled islands and beaches, spectacular wildlife and the tropical rainforests are all accessible from Cairns. Cairns has many great hotels and resorts to suit any budget. Silky Oaks Lodge, Daintree: Have you ever wanted to sleep in a tree house that is bounded by an ancient tropical rainforest and within striking distance of the Daintree National Park and the Great Barrier Reef, the lodge offers tranquillity, a world-class spa, brilliant cuisine etc. On the Inlet, Port Douglas: This is sited on an old wharf, it is a well-established seafood restaurant. Nothing too sophisticated about the place though, but it’s a great value for money. Queensland is unique amongst the Australian states in that it has some genuine coastal capitals. With incredible cities like Cairns, Townsville, Port Douglas, Brisbane, Rockhampton, Mackay, etc. At over 2000km long, the reef is quite big, and so it’s important to have a choice of your entry point. Some towns spread along the Queensland coast, which serves as gateways to the Cairns reef, plus there are a number of island resorts as well. Cairns: Cairns is irrefutably the main launching hotspot for reef tours. You can do anything from relatively inexpensive day trips on large boats to intimate five-day luxury charters. Townsville: Townsville is a renowned gateway among divers. Whether you’re learning or experienced, an onboard diving safari around the numerous islands of the reef is a great choice. Port Douglas: Port Douglas, just north of Cairns, is a classy resort town and a gateway to the Low Isles and Agincourt Reef, an outer ribbon reef featuring crystal clear water and particularly stunning corals. The Cairns Great Barrier Reef has no major seasons. There is no specific moment to visit the Great Barrier Reef: it can be enjoyed throughout the year. But from experience, the most suitable time to visit the Great Barrier Reef is from June to November when the weather is mild and visibility is good. In the summer months (December to March) the weather is warm, and the water temperature is around 30 degrees. This is the wet time of year and tropical cyclones are sometimes active in the region. – Footwear suitable for walking on jagged coral. – Floppy hats and loose-fitting T-shirts. – Tropical-strength mosquito repellent for the rainforest. That’s something I would probably try for next time. Cairns offered a lot of activities, I just had to choose. That would be great to do though. This post is very informational! This would be a very interesting place to travel to! Since I’m not a fan of diving, I think I would take the Scenic Flight! What a great guide to the Great Barrier Reef, including all the pertinent details! Can’t wait to travel there some day. I’m pinning this one! Thanks for the tips! We’re planning a trip for Cairns in September and will definitely be taking the underwater Camera. GoPro is awesome for that. Hadn’t thought about water shoes for the jagged coral though, so you’ve probably just saved my feet with this post!! I cant swim, is it suitable for someone that dont know how to swim? 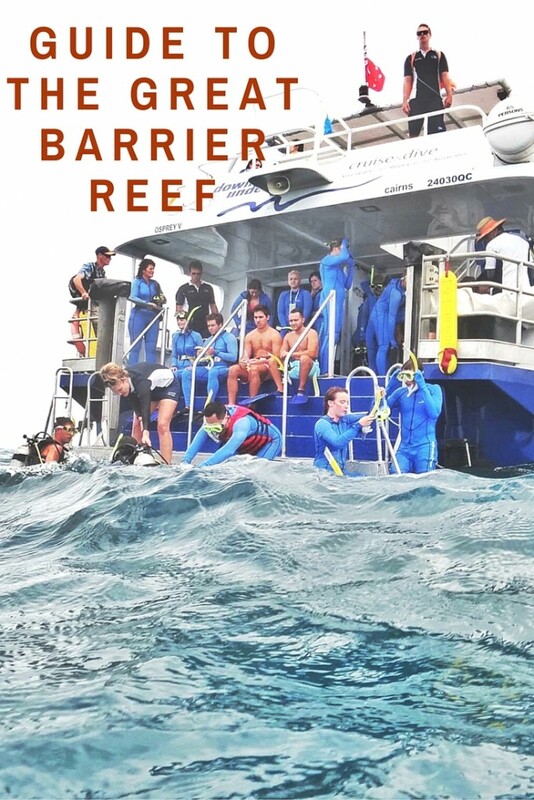 Great guide to the barrier reef – I can really second the taking motion sickness tablets – I had a horrible spell on the boat coming back from a day of diving that really too the shine off the day. But the diving was amazing before that! Thank you for the informative guide! It is a dream of mine to visit this natural wonder someday. It would be such an amazing vacation! We are actually discussing wonders of the world next week at our weekly Twitter chat, WeekendWanderlust – it’s Thursdays at 9pm ET / 6pm PT under the hashtag #WeekendWanderlust – if you’re interested in joining us with your expertise, of course! 🙂 Anyway, thanks again for the tips!! I adore snorkeling and this would definitely be something to learn how to scuba for! So much information in one place! Thanks for pulling all that together. Very useful. Thanks for all the great info! I especially appreciate the nearby towns and places to stay. For this experience, I would absolutely try to get over my fear of the ocean to snorkel or try scuba diving. It seems its these once in a lifetime experiences where I’m most successful! If not, though, I’d opt for the glass-bottom boat! Great guide! I love all of the different options you provided. I just left Cairns and we LOVED our time experiencing the reef. The snorkeling and semi-submersible tours were amazing, but our helicopter ride over the reef was my favorite. Loved seeing the colors and formations from above! As a diver, knowing how fragile coral reefs are, it’s kind of shocking to hear that there’s a way to walk on a reef, even on a trail. Just touching a reef damages it. I do think it’s important that people get an experience of the underwater world, the better to love and preserve it but have seen needless and irreparable damage done when they aren’t informed or careful. This is quite informative, you even included places to stay, good job! I want to do diving, but if it proves to be expensive then maybe I should just make do with the glass-bottom boat. OMG, the wondrous Great Barrier Reef. I hope to bring my family there someday and do the live aboard trip. Half of us dive and the other half can just be there for photos and fun. 😉 You did a really nice job on this post, lots of information and wonderful photos. I would love to snorkel the Great Barrier Reef. This was such a comprehensive guide. I really have had little desire to travel beyond the borders of my own country with few exceptions. Traveling to Australia and visiting the Great Barrier Reef has always been a dream of mine! Great tips! This is definitely on my bucket list!!! I would need a diving license to dive there right? Or do you think snorkeling is just as good as diving? Love to hear your opinion! I tried both. Yes, you do need a license to dive. I honestly preferred the diving. The water was choppy on the surface so it was quite a “hassle” to snorkel, but you can see really good marine life. Diving felt calmer and more relaxed. I am no diver nor swimmer but ever since I watched a documentary on the Discovery Channel many years ago about the Great Barrier Reef, I have always wanted to visit and preserve the area. Thanks to your lengthy presentation on what to do there, now that desire has been rekindled. Now I wonder when will I ever get there?!? Flight costs aren’t so bad now, you might just find it easier to go. A great way to start researching a trip. I’m getting certified next month and hope to go diving on the reef someday. Thanks for sharing. Was here in 2012 and did not have a great time. We got lost getting there and was really hung over! I almost vomited while snorkelling! I believe that could happen. One of my friends suffered the same fate but the rest were fine. The water can be choppy. I enjoyed diving more than the snorkeling, it felt more relaxing. I certainly need to heed the advice to avoid the sun. I’m just the type that would end up with a giant sunburn to enjoy my time at the Great Barrier Reef with. I love snorkeling and although scuba would be better, I’m sure there is some truly amazing snorkeling. This looks a great place to go! So much to do, yet you wouldn’t be missing the beauty of Creation. I have never explored a reef. Now I want to go suba diving. This is on my bucket list! I would love to go someday! Yes please. One day I shall make it here. This is a great guide. My sister is going there in September. I will share this with her. Wow! Nice tips. I wish someday I could visit Great Barrier Reef and enjoy the beautiful scenery. This is one of the best places to go to in the world and it’s really worth the trip. I would love to experience all the things you can do to enjoy it’s beauty, especially diving! My ex went and loved it. He brought back some really great pictures too! I really hope to be able to visit the Great Barrier Reef someday! Although I am TERRIFIED of Sharks so the glass bottom boat option sounds the best :). I would love to explore there. I think that would be an amazing experience. It looks like a ton of fun too. I have never been to a reef, so this is the perfect post for me! Thanks for all of the great tips! Cairns sounds like a wonderful place to visit & this is such an informative resource that will be so helpful for someone who would like to explore more fun out there. Amazing journey! WOuld love to try it! One of the places on my bucket list! Looks fantastic. I would love to visit the Great Barrier Reef someday, especially since the current state of our environment may leave it damaged or destroyed in the near future. What an amazing adventure!